one of China's major industrial centers, is 55 miles southwest of Mukden on the former South Manchuria Railway. The steel works established in 1918 were the largest in the Japanese Empire by the 1930s. The single tram route was opened in 1956 to provide transportation for the employees of the Anshan Steel Works. Trams 7077 and 1021 were photographed by R. Forty on June 14, 1984.
is a major railroad junction and manufacturing center at the edge of the Sungari River plain in northeast China. After invading Manchuria in 1931, the Japanese renamed this small farming city Hsinking and rebuilt it as the imperial capital of the puppet state of Manchukuo. By 1940 there were plans to build a metro, but instead, an electric tramway system was opened in 1942. The photo shows the inauguration. By the 1950s the system served the western industrial area of Changchun with 28 km of track and 98 cars. 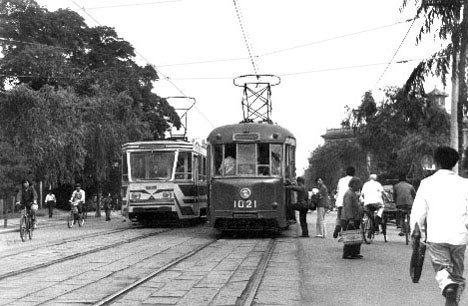 Trams still run in Changchun today. located on the coast of the Liaotung Peninsula 20 miles east of Port Arthur, has one of the finest harbors on the East Asia Coast and is northeast China's leading port. The city's development as a rail and manufacturing center began in 1898 when China leased the Kwantung Territory of Manchuria to Russia. The Japanese took over the lease in 1905 and extended it in 1915 for 99 years. 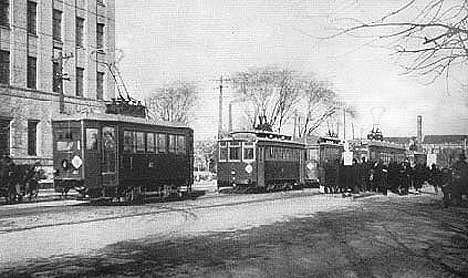 The tram system opened in September, 1909, and eventually had 20 km of track and 115 cars. There were ten routes, including two long suburban services to resort beaches. The postcard shows one of the original trams. in northeast China 30 miles east of Mukden, sits on a rich bituminous coal field. Its modern development was begun by the Russians in 1902 and continued by the Japanese. 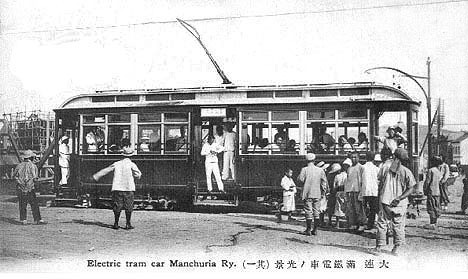 The South Manchuria Railway Company operated 26 of the large electric interurban cars shown in the photo for passenger service on various lines to the collieries around Fushun. on the Sungari River in almost the exact center of Manchuria, is a manufacturing and commercial city. Only a village in 1896, it grew rapidly after Russia completed the Chinese Eastern Railway to Port Arthur in 1898. 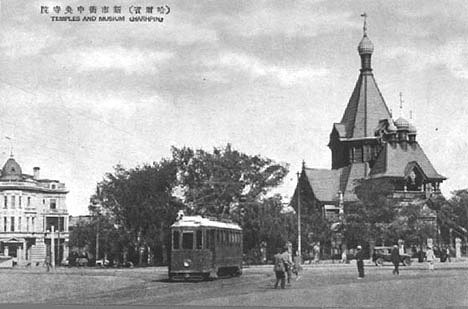 Harbin was inundated with White Russian emigres after World War I and seized by the Japanese in 1932. An electric tram system opened on Oct. 10, 1927, with nine miles of track and 14 trams, one of which can be seen on this postcard. The meter-gauge system eventually operated 40 trams on eight routes. Rail service ended June 17, 1987.
is a major industrial city on the Hun River in northeast China. It consists of three sections: the old walled city, the New Town (originally a Japanese Concession), and the Teihsi District, the industrial area. The ancient imperial capital of the Tatars and the base for the Manchu conquest of China, Mukden is the site of extensive palaces, mausoleums and monuments. A horse tramway opened in 1907. 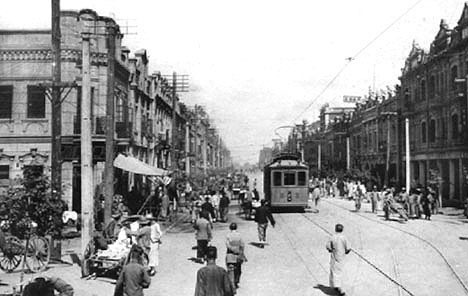 The Japanese opened an electric tramway in Oct. 1925, and by 1937 there were 12 km of track and 21 trams. The system expanded over the years and closed in 1973.